Odometers are extremely useful for cars, they tell you how far you have gone, wouldn't it be nice if you were able to have a device that does the same for electrical current? 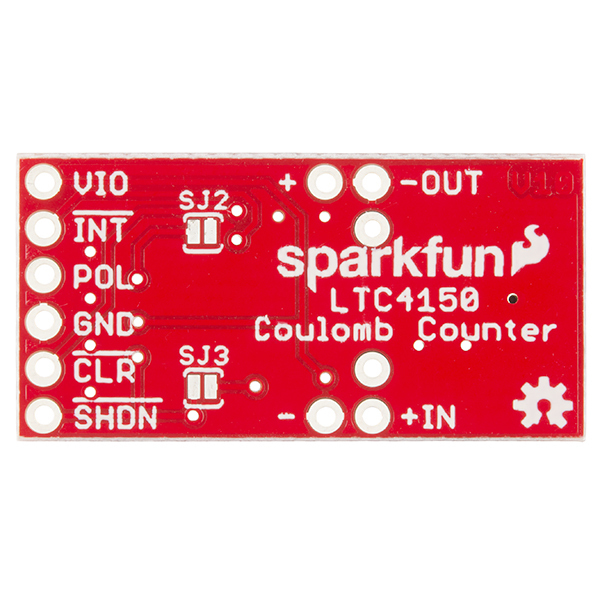 The LTC4150 SparkFun Coulomb Counter Breakout is here to be your odometer for current. If you are wondering: a coulomb is defind as, to put it simply, one amp for one second. This breakout is capable of constantly monitoring the current your sensor is using, is able to add it up, and will give you a pulse each time a given amount of amp-hours have been used. When used effectively and if you start with a full battery, you’ll always know exactly how much of it is left! At one end of the Coulomb Counter Breakout are headers labeled IN and OUT. 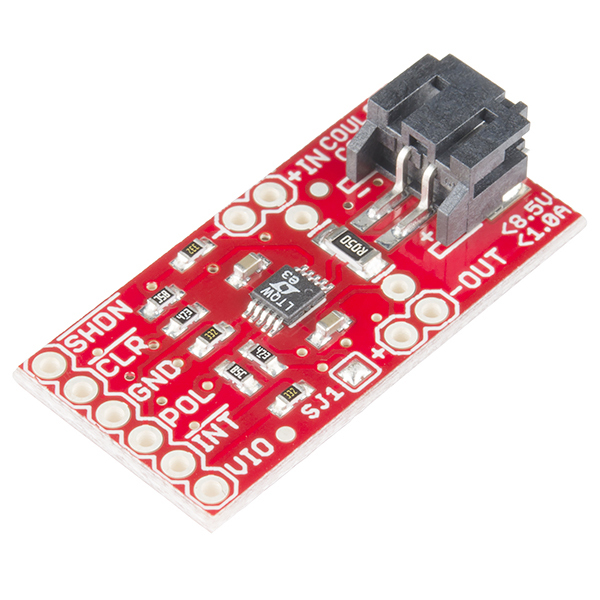 Connect your battery or power supply to the IN header or JST battery connector (they’re identical), and connect the OUT header to your project. At the other end of the Coulomb Counter you’ll find a header with six pins. 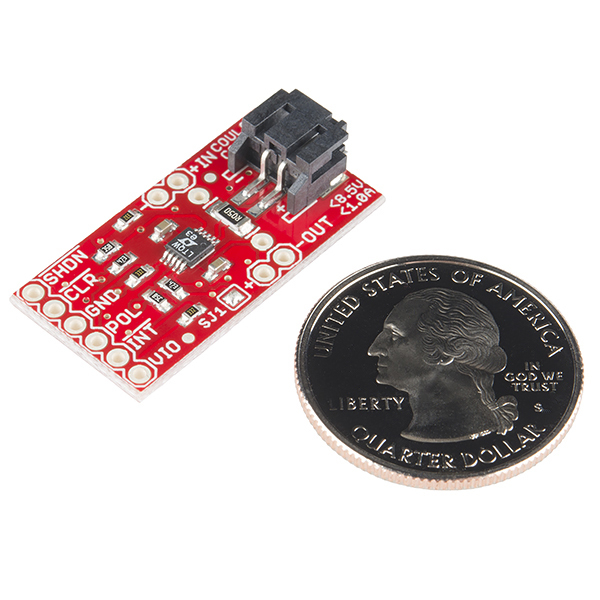 These are the pins you’ll need to connect to your microcontroller and include VIO (Voltage Input), INT (Interrupt), POL (Polarity), GND (Ground), CLR (Clear), and SHDN (Shutdown). Simply install this breakout out between your power source and your circuit, that way all the current your circuit uses needs to pass through the Coulomb Counter to be measured. TL;DR: If you don't want the energy consumed by the LTC4150 and pull-ups included in the total count, simply swap input and output. Like others, I have an application where I don't want the energy consumed by the LTC4150 counted towards the total. To the best of my understanding, you can solve that by simply by connecting your power source to the output terminals and your load to the input terminals. This works because the device measures bi-directional current, and takes its power from the "output" side of the sense resistor. I infer this from reading the data sheet and the schematics, but someone should back me up on this! I would like to use this to monitor power bidirectionally between battery and charging circuit. Is it safe to put the charger at the OUT header and the battery at the IN header? I tried it, works fine. The charger sends in coloumbs at about 760 mA! Thanks for a great little board, Sparkfun. Off the top of my head, because the board is bidirectional, that should work fine. The polarity indicator will just be reversed from "normal". BE CAREFUL IF YOU ARE POWER CONSTRAINT. Using it with a solar project. It works but the breakout is REALLY BAD DESIGN, imho. The problem is that the board leaks ~1mA through idiotic pull-ups (POL and others). It should not be surprising that this is used in context with very limited power supply. which makes the sloppy design even more embarrassing for Sparkfun. Please please update this! Hi - if you don't want the power consumed by the breakout board to be counted in the total, simply swap the input and output (see other comments above for why this works). Separate from that, it sounds as if 1A full scale is too large for your needs -- you can replace the 0.05 ohm shunt resistor with a larger value (0.5 ohms for 100mA full scale, 5 ohms for 10mA, etc). Between those two tweaks, this board might work better for you. The data sheet indicates that pullups are required for proper operation of the LTC4150 and the 3.3K resistors chosen are larger than the minimum required. Unfortunately we cant build a board that works for every customers unique situation but we to try to provide you with information that allows you to tailor a board to your requirements. I would suggest swapping R5,R7 and R9 out for larger value resistors to get a lower current drain. 10K's should work but you might try higher. Alternatively, you could remove those resistors altogether and use internal pullups on your Î¼C if it has that feature. If you find a value that works well, let us know. We may incorporate that into a future revision. Another good application: electric wheelchair batteries. 24V, OMG amps (but well under fifty), very flat discharge until the critical point when voltage drops abruptly. Having an "estimated hours of battery remaining" or some other representation other than the trivial voltmeter they come with would be a great device. I can start out with what appears to be a full charge and a block later I'm looking for someone to give me a push! A few experiments counting coulombs before battery discharge, and I've got a "countdown timer" for actual usage. 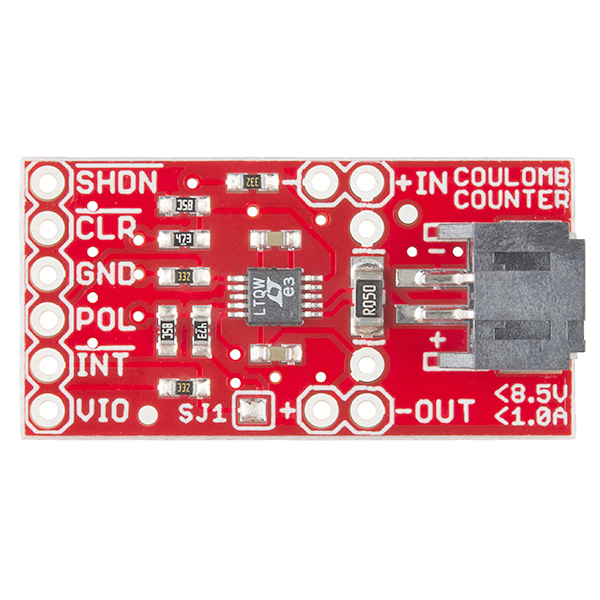 This coulomb counter is for MUCH smaller battery systems, obviously designed for small portable electronics. It should give a much more accurate approximation of the battery state, compared to just measuring voltage, especially for batteries that have a rather flat discharge curve. Too bad it isn't rated to 14V -- I'd love to have a something like this for the lead-acid batteries I need for ham radio field day, especially since I also use solar panels to charge them on-the-fly, so to speak. Oh, I also note this is only rated to 1A -- the radio can pull up to 15A or so. If this had specs I could use, the MicroView looks like it would be a good companion for this one. Looking at the schematic, there is a D1 shunt that appears to drop 0.05V at 1A. But it's in parallel with R2, which is only marked DNP. I'm not at all clear what DNP is about. If you wanted to measure more than 1A, the simple solution is to shunt the majority of the current externally, knowing the ratio between the two paths, and multiplying each 1A count by that ratio. The ohms value of the shunt would be very low, something that might be crafted with a carefully cut piece of heavy wire. In our world, "DNP" stands for "Do Not Populate". R2 is an empty through-hole resistor footprint provided in case someone wants to replace the existing surface mount R1 shunt resistor with a different-valued resistor. Yes, and thank you for providing that. I unsoldered the 50mÎ© surface mount resistor, and installed a 51Î© through-hole resistor, increasing the current sensitivity by a tad over a thousand. The problem with this board/chip is that the current line is not isolated from the electronics side of the circuit. Take a look at the ACS712 breakout board. It is totally isolated -- but be aware the Sparkfun design does not leave enough gap between the current trace and the electronics ground plane. (Look at the Allegro spec sheet.) It is a nifty board for circuits up to about 25V isolation. Also note that you can place a resistive shunt across the current sense terminal to increase the upper range. I use ACS712 board with a 500 amp shunt to monitor motor current in my electric vehicle. Allegro makes a 30A version of their Hall detector current sensor, would that be enough for your application? I had a little bit different application in mind, which was to track current draw of an Arduino differentiating states of high draw and low draw (as, for example, when the processor is sleeping). Unfortunately, when you do the math, the Coulomb counter will interrupt its host microcontroller at most once every 0.6 seconds and it will be only that frequent if the CC is measuring the maximum current draw for the sense resistor in place. If the current draw is less it could be many seconds between interrupts. It would be great if it were possible to reduce the downscaling on the board from 1024 to 128 or even 1. That would enable a finer resolution on the time at various current levels. I wanted to use this board to monitor the performance of an energy harvester, so I needed more than the default sensitivity. Accordingly, I unsoldered the 50mÎ© resistor provided and used the provided through holes to install a 51Î© resistor, increasing the sensitivity by lightly over a thousand. Now, with a 5ÂµA current, I get an interrupt every couple of minutes, and a simple Arduino sketch can convert that to current. However, this use case doesn't fit the "I'm being powered by the battery" assumption built in to the board, which made things a little tricky. Perhaps another jumper to disconnect the Vdd pin from the Vout+ pin? Additionally, one to connect Vdd to Vio would have been perfect for my application. Very easy to use. Had no trouble getting it up and running quickly. Looking forward to playing around with it further. This product does a great job with measuring moderate to high currents from 1mA, to 50-100mA or even more. If you're trying to track extremely low current accumulations (majority of time spent in uA range), you might consider swapping out the sensing resistor for a higher value, but of course this would yield a higher voltage drop across the device for 'run' current. If you use the self-clearing feature of the /INT line, be aware that this pulse width can be extremely short, on the order of a couple of uSecs, so either use a h/w IRQ line or a counter input, or switch over to manually resetting it via the /CLR line (you have to leave /INT asserted for at least 20uS before you clear it). NIce product for gathering real-world data! This looks like it would do the job I want. While the assumption that the counter chip is powered by Vin does not hold up well in practice, never underestimate the power of an X-Acto knife, a fine-tip soldering iron, and 30ga silicone wire to fix this problem. A 3-pin header with a jumper would have been better, allowing me to choose VIO or VIN. I plan to have several boards, with different values of resistors, and a relay external to the board to switch between VIN of the board and an internal-to-my-project Vref, and the ability of the software to select the voltage source going to the VIN of the chip. The idea is that during startup() the program will select Vref, and after a few seconds it will know which board was used. The design uses DuPont connectors on the board; to swap boards, disconnect the pins (three connectors), and replace it with a different board with a different Rsense, plug all the cables in, and the software will calibrate itself. A serious defect is that there is no fritzing file for this part. This and the need for an X-Acto knife is why I am giving it only a 4.